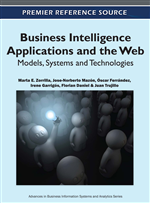 This chapter describes the convergence of two of the most influential technologies in the last decade, namely business intelligence (BI) and the Semantic Web (SW). Business intelligence is used by almost any enterprise to derive important business-critical knowledge from both internal and (increasingly) external data. When using external data, most often found on the Web, the most important issue is knowing the precise semantics of the data. Without this, the results cannot be trusted. Here, Semantic Web technologies come to the rescue, as they allow semantics ranging from very simple to very complex to be specified for any web-available resource. SW technologies do not only support capturing the “passive” semantics, but also support active inference and reasoning on the data. The chapter first presents a motivating running example, followed by an introduction to the relevant SW foundation concepts. The chapter then goes on to survey the use of SW technologies for data integration, including semantic data annotation and semantics-aware extract, transform, and load processes (ETL). Next, the chapter describes the relationship of multidimensional (MD) models and SW technologies, including the relationship between MD models and SW formalisms, and the use of advanced SW reasoning functionality on MD models. Finally, the chapter describes in detail a number of directions for future research, including SW support for intelligent BI querying, using SW technologies for providing context to data warehouses, and scalability issues. The overall conclusion is that SW technologies are very relevant for the future of BI, but that several new developments are needed to reach the full potential. the analysis layer, which contains a series of tools for generating the information from the normalized data so that it will be presented to analysts.